With over 200 indicators available to traders, it is impossible to pick the ones that will make money over and over again...until now. 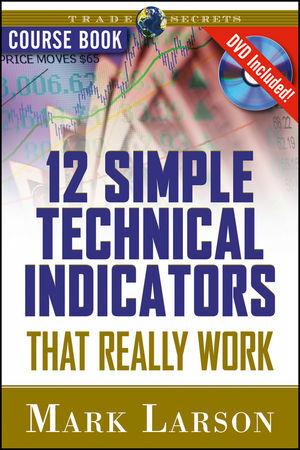 A two-time, best-selling author and writer of a weekly commentary at www.incometrader.com, Mark Larson is an expert trader willing to share the secrets of his favorite technical tools. To maximize the power of this guide, you'll also receive the full 90-minute DVD and access to an interactive online review tool at Traders' Library's Education Corner, including self-tests that make sure you absorb every valuable strategy. Utilize stock scans for a competitive edge. From standards like the MACD to newer tools like Time Segmented Volume and Inertia, Larson will teach you how each indicator works, how to use it effectively, and how to adopt it to your own unique trading style. Mark Larson is a seasoned trader, weekly writer for www.incometrader.com, and educator who has been actively trading the markets since 1998. As the founder of Rolling Along Investments and an instructor for Investools, he has helped thousands of investors of all types make money during up, down, or sideways markets using technical indicators and options. His best-selling books include Technical Charting for Profits and Trade Stocks Online.